For George Hendrick, the combination of a nervous pitcher and a hanging changeup was a recipe for hitting heroics. On May 12, 1984, Hendrick, the Cardinals’ cleanup hitter, ruined a no-hit bid by the Reds’ Mario Soto, slugging a home run with two outs in the ninth inning. Though the Reds recovered and rallied to win, 2-1, against closer Bruce Sutter, Hendrick’s home run after Soto got within a strike of a no-hitter got the headlines. Soto, 27, a right-hander, was in his eighth season with the Reds when he faced the Cardinals on a Saturday afternoon at Cincinnati’s Riverfront Stadium. Primarily relying on a fastball, Soto struck out 10 Cardinals in the first six innings and 12 overall. Backed by sparkling defensive plays from second baseman Ron Oester, who stopped an Ozzie Smith grounder in the seventh and swatted the ball to first baseman Dan Driessen, and from right fielder Dave Parker, who made a diving catch of Tommy Herr’s liner to the gap in right-center in the eighth, Soto held the Cardinals hitless. With a 1-0 lead, Soto faced Ozzie Smith leading off the ninth. Most of the 24,355 in attendance rose and cheered wildly. Instead of inspiration, Soto felt fear. Still, Soto had a promising start to the ninth. Ozzie Smith grounded out and Lonnie Smith popped out to second. That brought up Hendrick, who had entered the game with one home run and a .224 batting average. Soto got two strikes on the right-handed batter. Hendrick then fouled off a couple of pitches, building the drama. Hoping to induce Hendrick to swing and miss, Soto threw his next two pitches high. Hendrick wasn’t tempted, though, and the pitches were called balls, evening the count at 2-and-2. Looking to catch Hendrick off-guard, Soto delivered a changeup. “As soon as I threw the pitch, I said, ‘That’s trouble.’ I hung the pitch,” Soto said. Hendrick swung at the high, inside offering and walloped it over the left-field wall, tying the score at 1-1. Soto appeared stricken as Hendrick circled the bases. Instead, he walked the next batter, Andy Van Slyke, before getting Ken Oberkfell on a fly out to center, ending the inning. In his next start, Soto pitched a three-hitter and got the win against the Cubs, even though he yielded a two-run home run on a changeup to Jody Davis. “I’d say that three or four of the seven homers I’ve given up this season have come on the changeup, but that’s not going to stop me from throwing it,” Soto said to The Sporting News. Soto, who three times led National League pitchers in most home runs given up in a season, finished 1984 with an 18-7 record while yielding 26 home runs, second-most in the league and one behind Bill Gullickson of the Expos. In his last of seven seasons with the Cardinals. 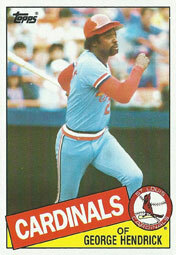 Hendrick finished 1984 with nine home runs and a .277 batting mark. I was at this game as a teenage Cardinal fan living in Ohio, sitting in the right field yellow seats at Riverfront Stadium. Still have the ticket stub. It was great to avoid the no hitter; it was a no doubt homer right off the bat that totally sucked the excitement out of the Reds crowd. Gulden grounded a 19-hopper through the hole on astroturf to beat Sutter. The Reds probably had more success against Sutter than anyone. The one thing this article failed to mention was that on the VERY last pitch BEFORE the homer, Soto brushed Hendrick back hard. I think George even hit the dirt avoiding the pitch that was WAY up and in. You could tell by his body language that Hendrick (as laid back as they came) was mad, and on the NEXT pitch he went deep. Crushed it into the 2nd deck at Riverfront. I mean that thing was a goner, as John Rooney would say, right off the bat. Thanks for the excellent first-person account. Thanks. I am glad you liked it. The brushback definitely motivated big George, and the bomb homer definitely shut the crowd up! As a writer and lifelong Cardinal fan, I would love to contribute to your excellent site. Even though the Cards lost that game, it was a good one and I was more relieved they did not get no hit – the loss seemed almost anticlimactic. Another classic game I went to was in 1985 at Cincinnati, a 12 inning loss where the Cards blew a 6-0 lead and lost after a 2-3 hour rain delay on a walk off walk by Pete Rose with the bases full. Andujar blew the big early lead and never won another game for the Cards after his 15-3 start and 21 wins that season. Adding to what I wrote above, I also remember the diving backhanded catch by Dave Parker in right field which was right down in front of me as I was sitting in RF seats. Parker, who was always a bit of a hot dog, slid on his side when he made the grab. Then he got up and waved his cap several times In a circular fashion. Nice grab, but big Dave (and his bad knees) made it look harder than it was. But the big thing in breaking up the no no was that Soto clearly brushed Hendrick back on the pitch before the homer. And even though Soto threw pretty hard, he got a lot of strikeouts with a very good change up. I enjoyed your vivid description and eye for detail. Thanks again. I write for some newspapers and websites, and have written some sports trivia game books, including one on Cardinal history. Ah, might you be the venerable baseball author, Mike Shannon? If so, I have read and enjoyed your work. I was sports editor of The Cincinnati Post from 1989-1997. No, I am not. That is cool you were sports editor of the Post. Unfortunately I think it went under a few years ago. Certainly hard times for the newspaper business. You must have some interesting stories to tell from that era with the Post and the Reds. The other memorable thing is what Hendrick said after the game when asked about the the knockdown pitch.